It has been awhile, sorry for the delayed post. There has been a big change in my life recently, which is why I’ve been distracted from my blog writing. If you didn’t know, I was accepted into the University of Minnesota’s Natural Resource and Science Management Graduate Program. My classes don’t start until the Fall, but I’ve been working over the summer as a Graduate Research Assistant (GRA) for my advisor (the professor who will be guiding me through grad school) and another professor. I’m helping with an observational study on the St. Croix River which is funded by the National Park Service (NPS). We’re observing how many folks are using the boat landings and what exactly they are doing at the landings (launching, taking-in, relaxing, picnicking, etc). Half of my job is counting folks every 15-minutes while sitting in my hammock, and my other half of the job is analyzing the data. Eventually, I—including my advisor and professor—will write and publish a public report for the NPS about the data we collected. Overall, transitioning from doing human resources work to graduate school has gone smoothly—except for the couple weeks where I worked over 50 hours; yuck! And It has been 5 years since I graduated from the University of Oregon, so I’ve been having to relearn a few things—especially statistics. Starting this week, I’ll have a 10-day stint observing on the river. Working 8-hour days on the river is tiring (not joking! ), but it’s hard to complain when you get a fantastic view of the river valley and I sometimes have visitors, such as friends or the occasional boat outfitter staff to keep me company. My observation site on the St. Croix River. Well, enough about my graduate school life, let’s talk about my mini-vacation in Washington D.C. The columns of the Jefferson Memorial. Colleen and Heath told me that I had to go out to the bars at least once while in D.C. because it’s an important part of the D.C. scene. I’m not much of a drinker/partier, but I decided to go along with it. The bar was fun and the beer was good, but the best part was catching up with Heath and seeing Colleen in her new city. 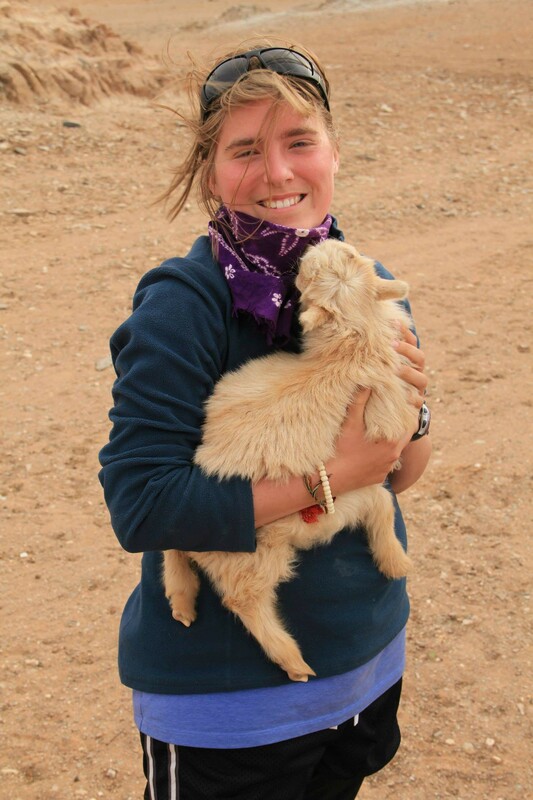 Colleen had only been in D.C. for a few months and she had recently gotten a full-time job at CET Academic Programs (she had been applying for jobs for almost a year!). So, our first evening together was one for celebration. After having a drink, Colleen, Heath, and I went on a walk in the nearby Adams-Morgan neighborhood. I got to see beautiful colonial style homes, even passing by the Obama house. Colleen and Heath told me the homes we were walking by could cost millions of dollars, even over 10 million dollars. I was astounded. The homes were pretty, but goodness is that A LOT of money. The following morning, Colleen and I made a small breakfast and then got coffee from a nearby cafe. Colleen had a full day quasi-planned out for me. First off, she wanted to show me her favorite park in the city: Rock Creek Park. It’s only walking distance from her apartment, so we walked with coffee in hand down into the Rock Creek River Gorge. I was surprised that such a dense river trail could be in the heart of D.C. There were lots of rhododendrons that lent us shade and wildflowers dotted throughout the ravines. I thoroughly enjoyed my jaunt in Rock Creek, especially in the Dumbarton Oak Park Conservancy. Colleen had mentioned to me that the weekend I was visiting was a special weekend because all the European (EU affiliated) embassies were open to the public. She also wanted to check out the Islamic Center, which also happened to be hosting a bazaar and public viewing—though the mosque is always public, this was an incentive for non-Muslims to feel comfortable seeing the space. So, Colleen and I walked from Rock Creek Park to the Islamic Center, we checked out the bazaar, ate treats, and then watched a prayer within the mosque. I picked up a Quran as well. Men in prayer in the Islamic Center. The ladies prayer room was downstairs. I learned while at the Islamic Center that before prayer, all worshipers clean themselves. They clean their arms, hands, legs, feet, and face before going to prayer. In the basement, there were many facets and women sat in front of these faucets and cleaned themselves before entering the prayer room. I also learned a bit of history from a gentleman leading a tour of the facility. I’m really glad Colleen and I stopped by and I would recommend anyone to check it out if you’re ever in the area. After visiting the mosque, Colleen and I walked up embassy row. We walked by many different embassies, which all had long lines to enter, and decided to visit the Italian embassy—mostly because they were serving pizza. While walking up the hill, Colleen pointed to the distance and said she’d always wanted to check out the cathedral at the top of the hill. I thought, well, why not check it out. After a brief discussion, Colleen and I decided to walk to the cathedral. When we arrived, we learned that it’s called the Washington National Cathedral and that it took 83 years for the structure to be fully built—the foundation was set by Theodore Roosevelt and the final construction was attended by George W. Bush senior; now that’s perspective! The view at the top of the cathedral. Colleen and I on the viewing floor. The admission is $12 for adults ($8 if you’re a student), but you definitely pay for what you get. The inside was beautiful, especially the stained glass windows, and the tour was very well done. Colleen and I cut the tour short so that we could go to the viewing floor since the cathedral was closing early for Saturday evening worship. And I’m glad we did because Colleen and I got a fantastic view of the city. Colleen bicycling below the Washington Memorial. 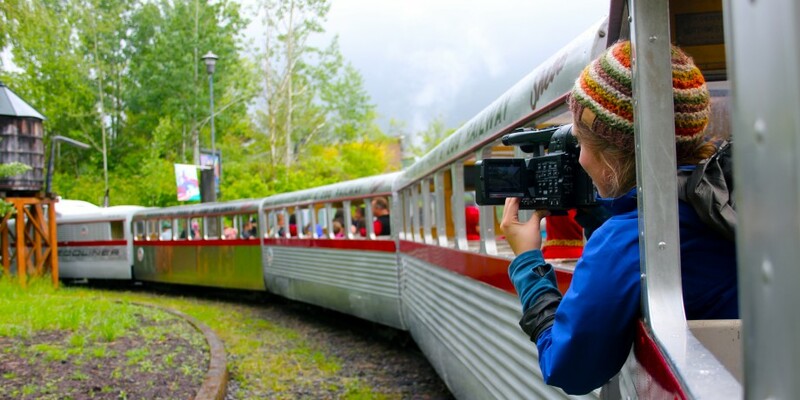 The following day was a day of classic tourism. By bicycle, Colleen gave me a tour of the city, specifically the National Mall area. What made this special was that Colleen at this time (but not currently anymore) was a Washington D.C. tour guide. So, she knew all the fun facts and stories to tell me as we biked by the White House, the Washington Monument, the War Memorials, and the presidential memorials. 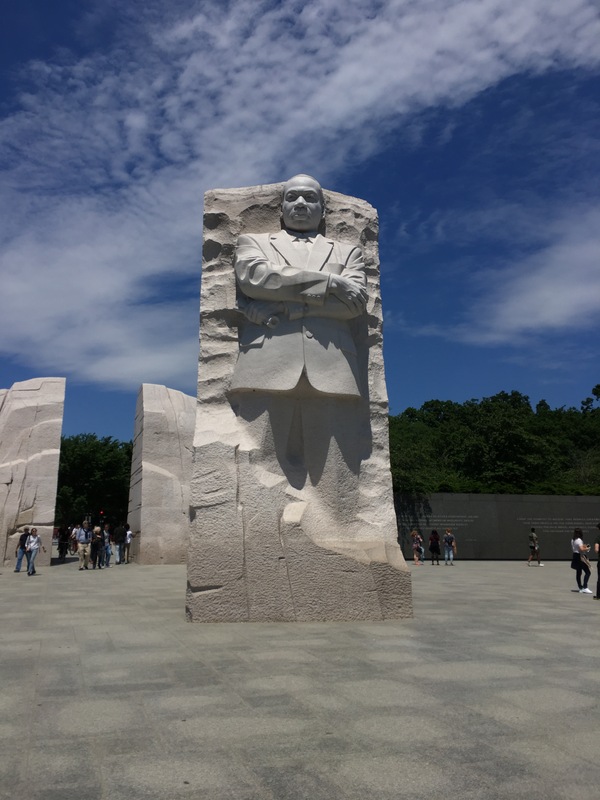 The newest Memorial: The Martin Luther King Memorial. My favorite facts that Colleen told me I did not photograph, but it pertains to the WW2 Memorial and the Korean War Memorial. 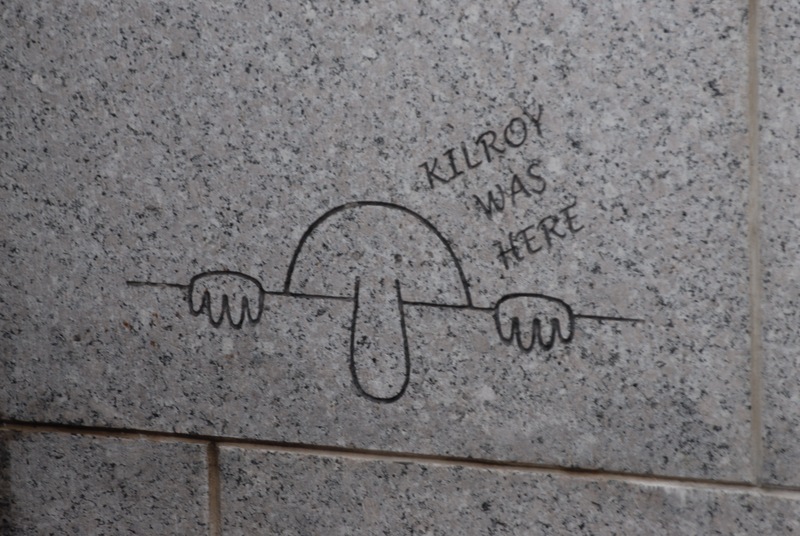 At the WW2 Memorial, Colleen put me on a scavenger hunt to find Kilroy. I didn’t know what I was looking for, but Colleen told me that during the War, Kilroy would be spray painted all over the place. I searched and searched, but in the end, Colleen had to show me where Kilroy was. The other cool fact was that at the Korean War Memorial, each of the statues was facing a slightly different direction so that from any angle, you look into the eyes of one of the Korean War statues. It’s was the eeriest Memorial, in my opinion. After a day of memorials, Colleen and I met one of Colleen’s friends in the historic neighborhood called Georgetown for dinner. 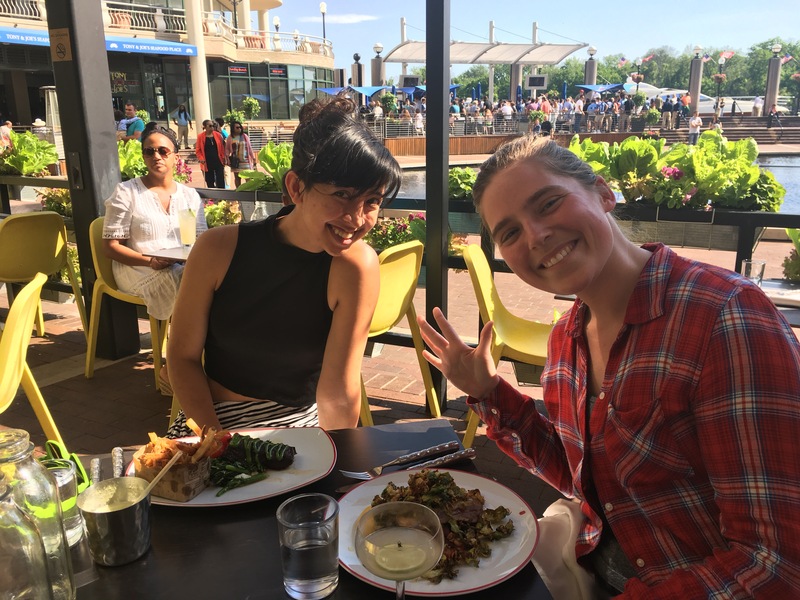 Colleen told me it was a restaurant that she always wanted to try, because not only does it get great reviews for its food, but it is situated just off the Potomac River. The wait was 1.5 hours, so we took that time to explore the old colonial homes that border the cobblestone streets. Some of Washington D.C.’s oldest buildings reside in Georgetown; including The Old Stone House (built in 1765). After dinner, we returned to Colleen’s apartment and Colleen brought me to one of her favorite things to do in D.C. It’s called the Meridian Hill/Malcolm X Park Drum Circle and it’s held every Sunday starting at 3 pm. It’s been happening for over 40 years and was inspired during the times of the Civil Rights Movement and perhaps originally sparked by Malcolm X’s assassination. I sat on the steps and watched the spectacle while Colleen got up and danced to the beat. Feeling the drum beat within me and watching as people expressed themselves through dance, martial arts, hula hoops, and instruments was the perfect way to end the day. A view from within Shenandoah National Park. The next morning, Colleen and I woke up bright and early to beat the traffic out of D.C. Something I had told Colleen before coming was that I really wanted to either see the ocean or go hike a mountain while in D.C. Colleen did some research and told me about Shenandoah National Park and how she hadn’t been yet. It was decided then that we had to go, especially since it is only a 45-minute drive from the city! 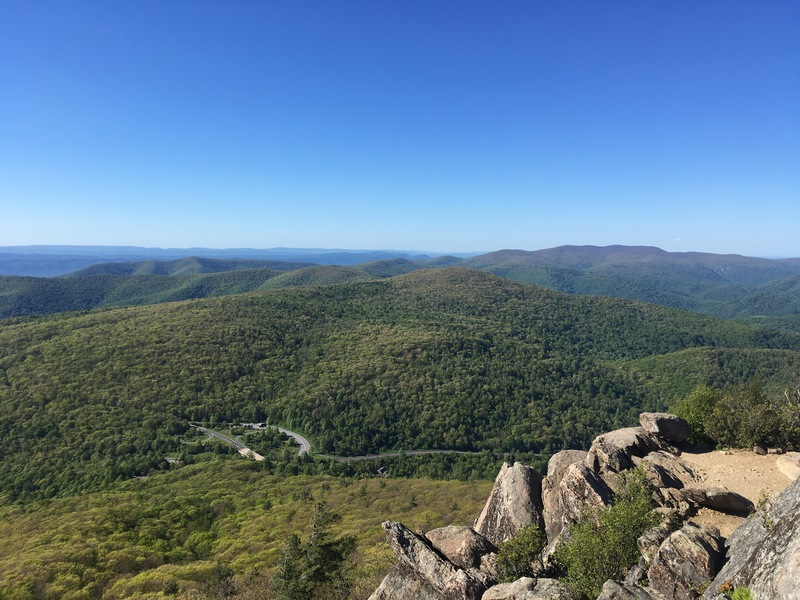 Once we reached the Shenandoah National Park boundary, the landscape changed drastically. The road became very steep and we were shaded above by a canopy of a deciduous forest. 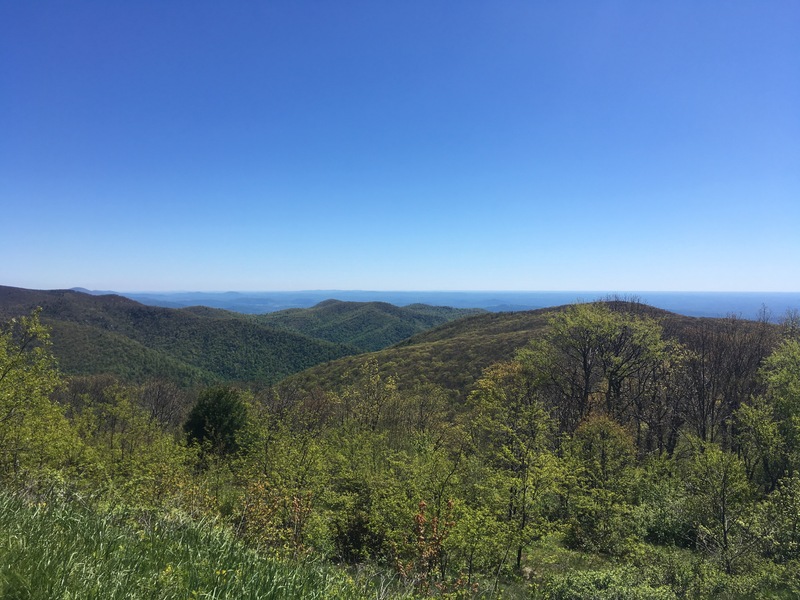 Our GPS told us we were on Skyline Drive, which we learned later is a scenic highway that cuts across all of Shenandoah NP. 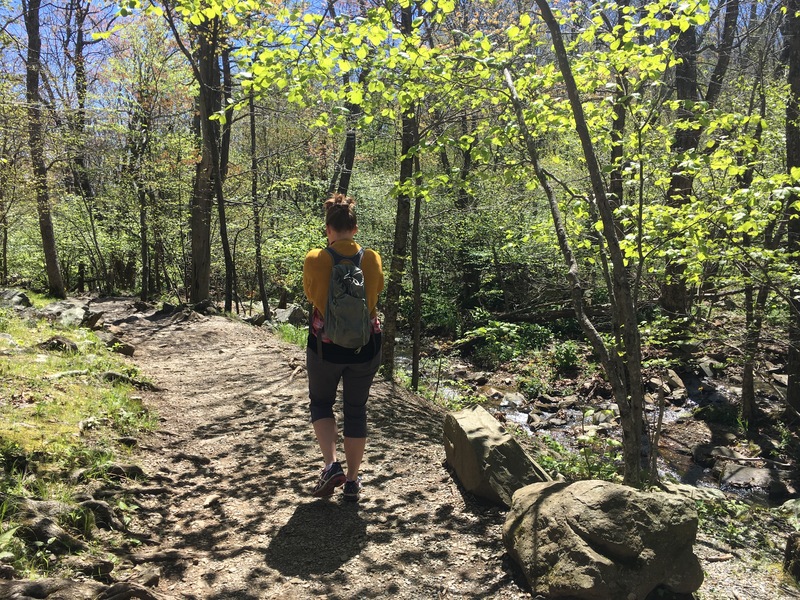 We stopped by the visitor center and the ranger advised us to hike the Rose River trail because in one trail you get waterfalls, quiet creek beds, and a not-too-awful incline. And, well, he was right. We parked at the Dark Hallow Falls parking lot and then started our hike on the Dark Hallow Falls trail. It only took about 10 minutes to hike to the Falls. We took pictures and then continued on until we hit the Rose River Loop trail. We made a right at the fork and followed the Rose river creek bed for the next 2.5 miles. 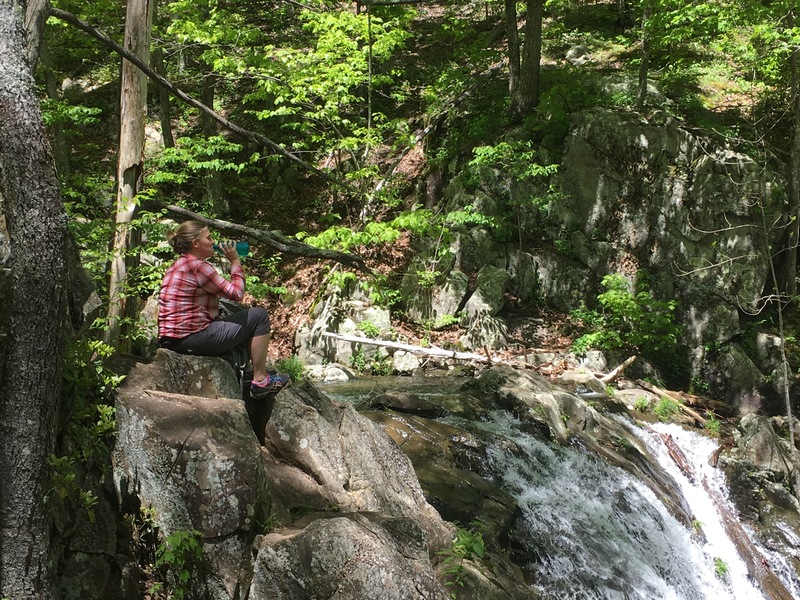 Colleen drinking water beside the Rose River Falls. This was a really nice trail. It was shady, which was perfect because it had gotten hot by the early afternoon. It also housed many different types of birds. We heard a Veery and we even saw a warbler with the help of my binoculars! The best part was listening to the sound of water trickling down the Creek all along our hike. By the time we reached the fire road, which would loop us back to our car, Colleen and I decided it would be best to hitch hike. It would save time (and we were feeling a bit tired). So, we got on the side of the road, stuck our thumbs out, and hoped for the best. While waiting, I reminisced about how the last time I had hitchhiked I was in South Carolina in 2012. I caught a ride from Charleston, SC to Greenville, SC. I guess I tend to catch rides in the South? After about 7-10 minutes, a car stopped for us and it ended up being a husband and wife from South Korea. We thanked them profusely all the way back to our car. Colleen and I were pretty pooped after our morning hike, but Colleen was adamant about getting a mountain top view. 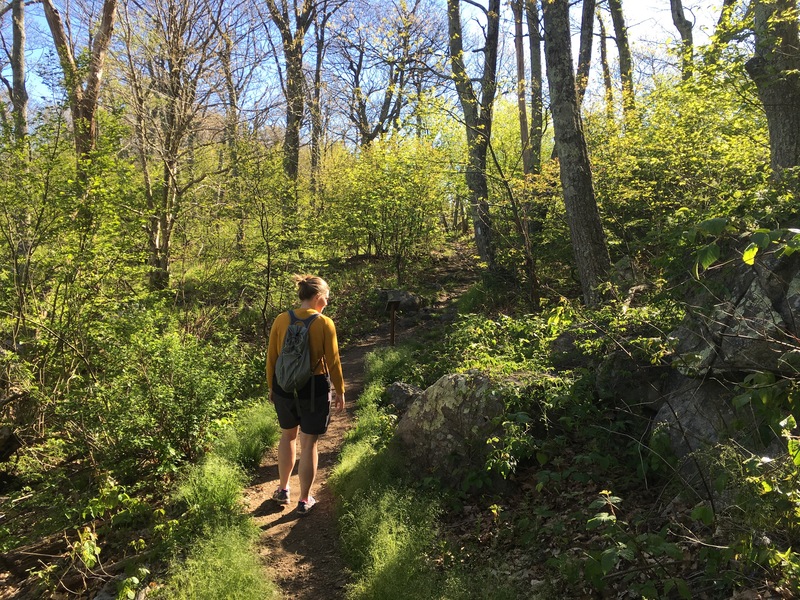 I was hesitant at first because I had a plane to catch that evening, but once I was on the trail, my doubts disappeared and I hiked as quickly as I could to the top. While hiking, we passed by backpackers. 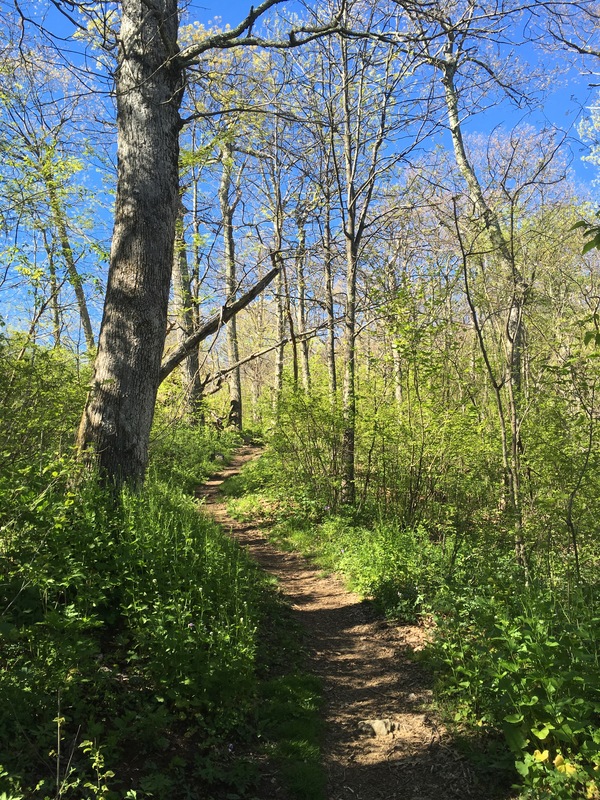 I didn’t realize until then that we were on a section of the Appalachian Trail. 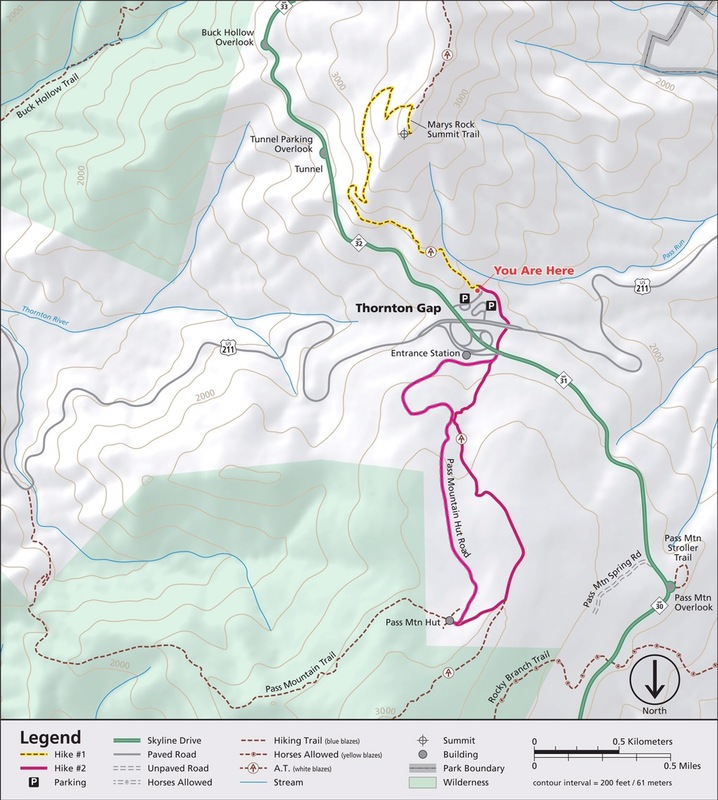 A part of me felt giddy; now I’d touched both the Pacific Crest Trail (PCT) and the Appalachian Trail (AT). Sometime in the future, I hope to hike them both one day. The view from Mary’s Rock was spectacular. It was definitely worth the hike. 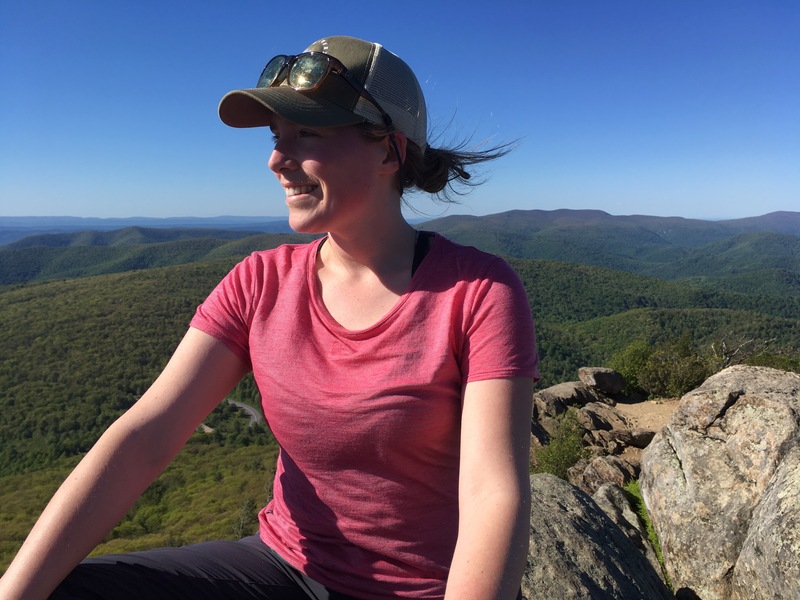 For our last moments on the ridgeline, Colleen and I sat atop the peak, soaking in the views surrounding us. Colleen hiking on the Appalation Trail. I really enjoyed our time at Shenandoah NP. 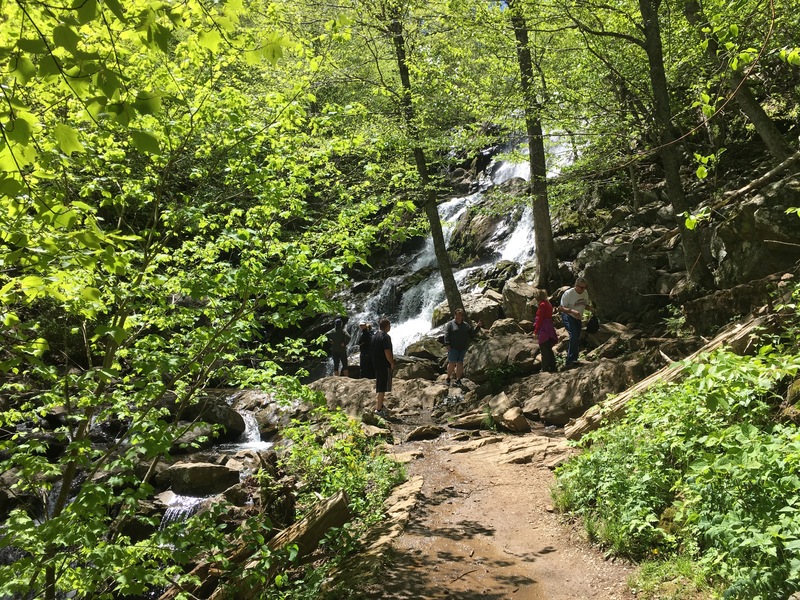 The trails we hiked were beautiful and the views of the Blue Ridge Mountains made me fully appreciate the lyrics to Take me Home, Country Roads. I have to say that my trip to Washington, D.C. was a great getaway for a long weekend. Thanks again Colleen for showing me around and being my tour guide! Category: USA, Virginia, Washington D.C. 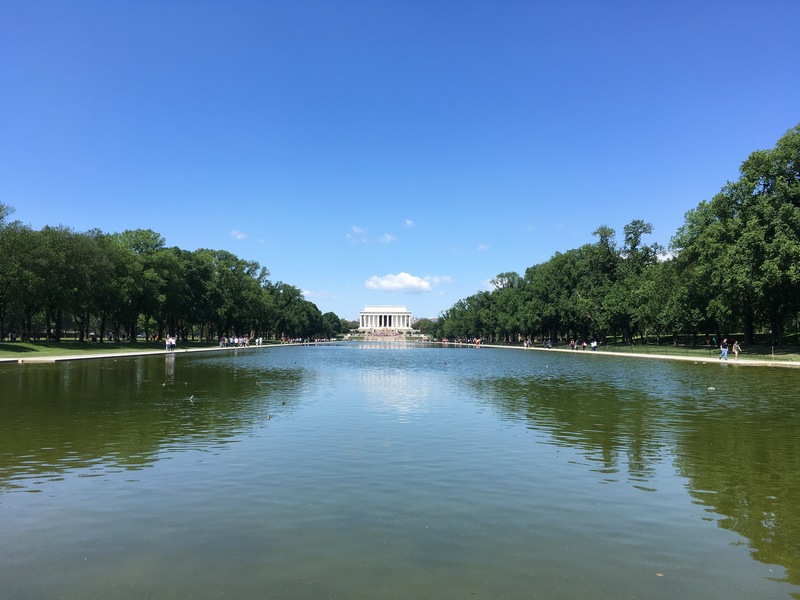 Tags: Coffee, D.C., Embassy Row, Graduate school, Hiking, Memorials, Mosque, Rock Creek Park, Shenandoah, Shenandoah NP, Sister Love, Travel, Twin Sister, Washington D.C.
That sounds like such a great trip (especially in just one weekend!). Your pictures are really lovely – I had no idea how much beautiful nature there is so close to such a big city!